I’m at a loss to find a hook here that appeals to a student’s prior experience, that lets one student debate another. It may be that we can’t manage one for this problem. We can, however, make a better visual. 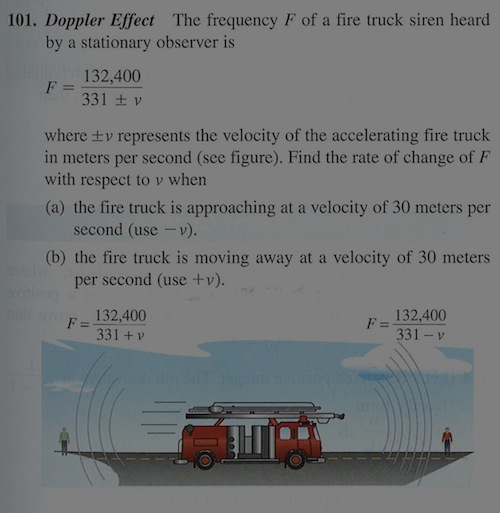 The problem concerns sound and velocity, neither of which can be represented on paper so I’d set up a camera on a tripod outside the fire station and pan with the truck as it passed by me. The most compelling hook here involves the percent of the pool filled at a given moment. Everyone can guess at the answer and involve themselves in the problem. They’d involve themselves more, though, with a better visual. “Watch this time-lapse video of a pool filling. 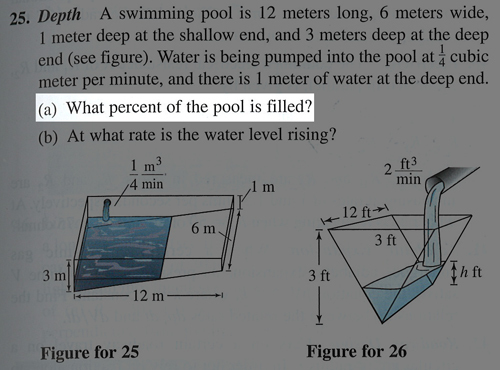 Tell me when it’s fifty percent full.” The calculus concept here is the water level’s change over time. How do you adequately represent the rate the water level is rising (or anything differentiated with respect to time) on paper? Great hook. Let’s lose part (a) though. Give your students a moment to get their heads around the problems, to see that they need to know the rate at which the distance between the planes is decreasing. After that moment, then tell them if they can’t see it. Again, we need a visual of two planes closing in on each other. (Logistics obviously demand a computer simulation, not video.) 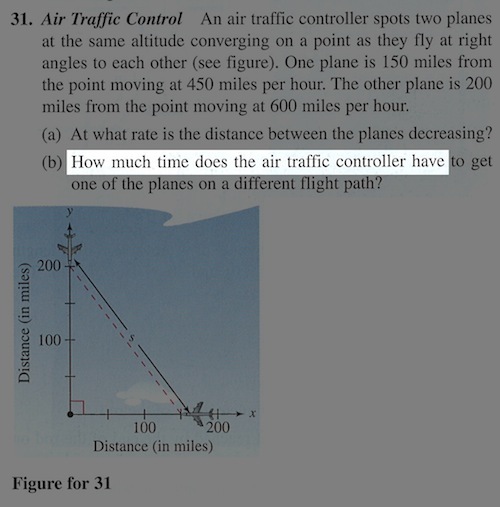 Then students can put a guess down for how much time the planes have left. Not a terribly gripping hook, but who says every calculus problem has to play with hot fire to be worthwhile? Ideally we’d have video of a shuttle launch here so that students could see for themselves that as the shuttle gets higher in the sky, the camera angle doesn’t have to increase as quickly to keep up. This one has a great, guessable hook. 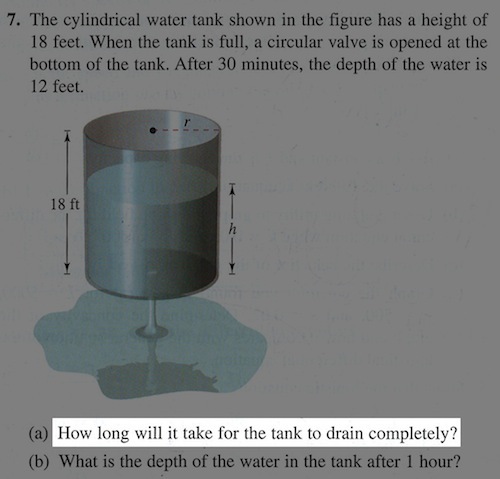 It just needs video of the problem so that students can guess the answer and involve themselves in the problem. Then, rather than report the answer from the answer key, you can show the answer in the world itself, by playing the end of the video.